Bath Soap: Bedu Naturals, TheraNeem, South of France, Zion Health! • Camel Milk Face & Body Soap African Black: CLEAR - CALM - PURIFY. African Black Soap brilliant for problem skin, enriched with antioxidants and antibacterial properties that help check breakouts. It nurtures skin and help reduce acne. 4 oz. ORDER TODAY! • Camel Milk Face & Body Soap Black Seed & Frankincense: DEEP CLEANSE - RENEW. Black Seed helps slow the aging process and softens the skin. Good for sensitive and mature skin. Black Cumin Seed Oil helps treat auto-immune, skin disorders including eczema and psoriasis and dandruff. 4 oz. ORDER TODAY! • Camel Milk Face & Body Soap Evening Primrose & Vetiver: RESTORE - CALM. Evening Primrose is the finest remedy to cure eczema and many other skin-related problems. Gentle and can be used as moisturizer to keep dry areas hydrated. Vetiver fades dark spots and scars, restores skin tissues, creates a smoother, younger-looking complexion. 4 oz. ORDER TODAY! • Camel Milk Face & Body Soap French Clay & Rosewood: DETOX -REVITALIZE. French Clay restores and rejuvenates skin tissue, draws out toxins, unclogs and shrinks pores. It helps clear acne and blocks breakouts. Outstanding natural exfoliator, and it smooths out skin tone. Rosewood stabilizes skin and slows the aging process by increasing the renewal of skin tissues. It reduces the appearance of scars and fine lines, soothing scar tissue to be more soft and flexible. 4 oz. ORDER TODAY! • Camel Milk Face & Body Soap Lemongrass & Aloe: DEEP CLEANSE - NOURISH. Lemongrass helps restore pH balance, tones the skin, reduces pores, acts as an astringent, and is both anti bacterial and anti microbial. Aloe Vera has effective skin healing properties, reduces inflammation, encourages healing, strengthens and moisturizes, and recovers skin elasticity. 4 oz. ORDER TODAY! BAR SOAPS: Camel Milk Face & Body Soap, 4 oz. • Camel Milk Face & Body Soap Moroccan Clay & Cinnamon: DETOX - BALANCE. Moroccan Clay eliminates oil and impurities from pores, even stubborn blackheads, providing a general smoothing of the skin. It improves skin clearness and elasticity, and leaves skin feeling softer and supple. Cinnamon is a potent regulator of collagen. It plumps the skin, and is an antiseptic. Ideal for problem skin and is a great natural cleanser. 4 oz. ORDER TODAY! • Camel Milk Face & Body Soap Pearl Powder & Kalahari Melon Seed: BRIGHTEN - SMOOTH. Pearl Powder is made with Amino Acids to repair shine, smoothness and elasticity to the skin. It helps relieve inflammation and encourages healing. Used as a skin brightener, and helps block wrinkles and is used as sun protection. Kalahari Melon Seed is intensely hydrating, renews skin elasticity, and fights wrinkles. It breaks up excess sebum and improves the skin. Enriched with essential fatty acids (critical in keeping skin moisturized, plump and young looking). 4 oz. ORDER TODAY! • Camel Milk Face & Body Soap Rose of Jericho & Myrrh: ULTRA HYDRATING - RESTORE. Rose of Jericho (Resurrection Plant) has exceptionally high water retention capacity, which hydrates the skin thoroughly. It revitalizes the skin's natural moisturization ways, reduces the results of oxidative stress, recovers cellular density and reduces water loss. Myrrh is an effective antioxidant, antibacterial, and anti-fungal botanical that calms and heals chapped, cracked skin. 4 oz. ORDER TODAY! • Camel Milk Face & Body Soap Turmeric & Honey: INTENSE MOISTURE - FIRMING. Turmeric is a powerful antioxidant and anti-inflammatory. Helps treat acne blemishes, blackheads, dark spots and hyper pigmentation, and other skin conditions such as eczema and psoriasis. Helps restore and check dry skin, and to slow the skin aging process. Helps reduce wrinkles, to keep skin supple and recover skin elasticity. Honey is perfect for all skin types. Packed with antioxidants, it helps repair damaged and wrinkled skin. It is exceptionally hydrating, but will not cause breakouts. Helps accelerates skin healing and soaks up impurities to detoxify the skin. Helps to absorb and lock in moisture in the skin. 4 oz. ORDER TODAY! • Camel Milk Face & Body Soap Sandalwood & Saffron: BRIGHTEN - TONE. Sandalwood is skin softening, antiseptic, anti-inflammatory. Saffron recovers skin tone, bringing glow to dull to skin, freshness and nurture to prematurely ageing skin. Helps treat blemishes and dark circles, encourage blood circulation, thus providing brilliance to the skin. Perfect for healing acne and brightening the complexion. Helps heal dry skin and improve skin texture. 4 oz. ORDER TODAY! Packed with antioxidants, Neem helps defend, nurture, and hydrate the most sensitive skin. Paraben Free, Sulfate Free and Gluten Free. 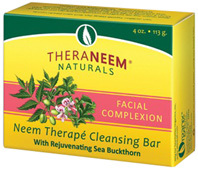 • Neem Therape Cleansing Bar Soap Facial Complexion: Made with Neem Oil and revitalizing Sea Buckthorn for a clean, refreshed and glowing complexion and great for the whole body. 4 oz. ORDER NOW! Ingredients: Olea Europaea (Olive) Fruit Oil, Calendula Officinalis (Marigold) Petal Extract, Cocos Nucifera (Coconut) Oil, Water (Aqua), Elaeis Guineensis (Palm) Oil, Sodium Hydroxide, Azadirachta Indica (Neem) Seed Oil, Pelargonium Graveolens (Rose Geranium) Flower Oil, Salvia Sclarea (Clary Sage) Oil, Butyrospermum Parkii (Shea Butter), Hippophae Rhamnoides (Sea Buckthorn) Oil, Rosmarinus Officinalis (Rosemary) Leaf Extract. 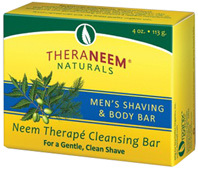 • Neem Therape Cleansing Bar Soap Men's Shaving: Made with Neem for a gentle, clean shave and great for the whole body. 4 oz. ORDER NOW! Ingredients: Olea Europaea (Olive) Fruit Oil, Cocos Nucifera (Coconut) Oil, Elaeis Guineensis (Palm) Oil, Water (Aqua), Sodium Hydroxide, Azadirachta Indica (Neem) Seed Oil, Butyrospermum Parkii (Shea Butter), Juniperus Virginiana (Cedarwood) Oil, Abies Sibirica (Fir) Needle Oil, Simmondsia Chinensis (Jojoba) Seed Oil, Evernia Prunastri (Oakmoss) Absolute, Rosmarinus Officinalis (Rosemary) Leaf Extract. • Neem Therape Cleansing Bar Soap Ultimate Support Orange & Ylang Ylang: Made with Neem Oil and the most concentrated aromatic bar. For challenged skin, fragranced with Orange and Ylang Ylang. 4 oz. ORDER NOW! Ingredients: Olea Europaea (Olive) Fruit Oil, Cocos Nucifera (Coconut) Oil, Elaeis Guineensis (Palm) Oil, Azadirachta Indica (Neem) Seed Oil, Water (Aqua), Sodium Hydroxide, Butyrospermum Parkii (Shea Butter), Citrus Sinensis (Orange) Peel Oil, Cananga Odorata (Ylang Ylang) Flower Oil, Simmondsia Chinensis (Jojoba) Seed Oil, Rosmarinus Officinalis (Rosemary) Leaf Extract, Calendula Officinalis (Marigold) Petal Extract. 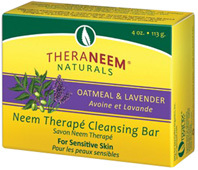 • Neem Therape Cleansing Bar Soap Oatmeal & Lavender: For delicate and sensitive skin. 4 oz. ORDER NOW! Ingredients: Olea Europaea (Olive) Fruit Oil, Cocos Nucifera (Coconut) Oil, Elaeis Guineensis (Palm) Oil, Sodium Hydroxide, Water (Aqua), Azadirachta Indica (Neem) Seed Oil, Lavandula Angustifolia (Lavender) Oil, Butyrospermum Parkii (Shea Butter), Avena Sativa (Oat) Meal, Simmondsia Chinensis (Jojoba) Seed Oil, Rosmarinus Officinalis (Rosemary) Leaf Extract. • Neem Therape Cleansing Bar Soap Neem Leaf, Oil & Bark: Made with Neem Oil, perrfect for gardeners' hands, dry skin, gentle exfoliation and great for the whole body. 4 oz. ORDER NOW! Ingredients: Olea Europaea (Olive) Fruit Oil, Cocos Nucifera (Coconut) Oil, Elaeis Guineensis (Palm) Oil, Water (Aqua), Sodium Hydroxide, Azadirachta Indica (Neem) Seed Oil, Butyrospermum Parkii (Shea Butter), Simmondsia Chinensis (Jojoba) Seed Oil, Azadirachta Indica (Neem) Leaf Powder, Azadirachta Indica (Neem) Bark Powder, Rosmarinus Officinalis (Rosemary) Leaf Extract. • Neem Therape Cleansing Bar Soap Lemongrass & Patchouli: Made with Neem Oil, ideal for oily or acne-prone skin and is gently soothing to support a glowing complexion. 4 oz. ORDER NOW! Ingredients: Olea Europaea (Olive) Fruit Oil, Cocos Nucifera (Coconut) Oil, Elaeis Guineensis (Palm) Oil, Water (Aqua), Sodium Hydroxide, Azadirachta Indica (Neem) Seed Oil, Butyrospermum Parkii (Shea Butter), Cymbopogon Citratus (Lemongrass) Oil, Pogostemon Cablin (Patchouli) Oil, Simmondsia Chinensis (Jojoba) Seed Oil, Rosmarinus Officinalis (Rosemary) Leaf Extract. • Neem Therape Cleansing Bar Soap Maximum-Strength: Made with organic Neem Oil, calming Olive, Coconut, and Jojoba Oils, Shea Butter and Rosemary Leaf for optimum cleansing benefits for your skin. No fragrance added. 4 oz. ORDER NOW! Ingredients: Olea Europaea (Olive) Fruit Oil, Cocos Nucifera (Coconut) Oil, Elaeis Cuineensis (Palm) Oil, Azadirachta Indica (Neem) Seed Oil, Water (Aqua), Sodium Hydroxide, Butyrospermum Parkii (Shea Butter), Simmondsia Chinensis (Jojoba) Seed Oil, Rosmarinus Officinalis (Rosemary) Leaf Extract. 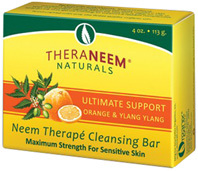 BAR SOAPS: Neem Therape Cleansing Bar Soap, 4 oz. 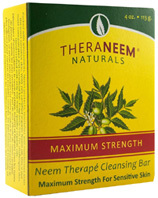 BAR SOAPS: Neem Therape Cleansing Bar Soap, Facial Complexion, 4 oz. • Natural Beauty Bar Soap Daily Moisture: Treat your skin the moisture it requires with Natural Beauty Bar Soap Daily Moisture. Made with hydrating Olive Oil and natural Vitamin E to leave your skin clean and fresh. Helps retain your skin's moisture every time you use Natural Beauty Bar Soap Daily Moisture. 4 oz. ORDER NOW! Ingredients: Sodium Palmate, Sodium Cocoate, Sodium Palm Kernelate, Water, Glycerin, Natural Fragrance, Sodium Chloride, Sodium Gluconate, Olea Europaea (Olive) Fruit Oil, Simmondsia Chinensis (Jojoba) Seed Oil, Tocopheryl Acetate (Vitamin E Acetate). • Natural Beauty Bar Soap Relaxing: Uplift your senses with Natural Beauty Bar Soap Relaxing. Made with soothing Lavender, rich, hydrating Olive Oil, and natural Vitamin E to leave your skin clean and fresh. Utilizing the steam of your shower to generate a relaxing refuge from daily stress, without the artificial or synthetic ingredients. 4 oz. ORDER NOW! Ingredients: Sodium Palmate, Sodium Cocoate, Sodium Palm Kernelate, Water, Glycerin, Natural Fragrance, Sodium Chloride, Sodium Gluconate, Olea Europaea (Olive) Fruit Oil, Simmondsia Chinensis (Jojoba) Seed Oil, Tocopheryl Acetate (Vitamin E Actate). • Natural Beauty Bar Soap Sensitive: Pamper your sensitive skin to a little extra loving care with Natural Beauty Bar Soap Sensitive. Made with calming Chamomile, hydrating Olive Oil, and natural Vitamin E in this hypoallergenic fragrance free bar soap to leave your skin clean and fresh. Clinically proven to be gentle on your sensitive skin without the artificial or synthetic ingredients. 4 oz. ORDER NOW! Ingredients: Sodium Palmate, Sodium Cocoate, Sodium Palm Kernelate, Water, Glycerin, Sodium Chloride, Sodium Gluconate, Olea Europaea (Olive) Fruit Oil, Simmondsia Chinensis (Jojoba) Seed Oil, Tocopheryl Acetate (Vitgamin E Acetate), Anthemis Nobilis Flower Oil. • Natural Beauty Bar Soap Deodorant: Deodorant Body Bar is made with the natural odor-fighting properties of Sage and Lemongrass to provide you feeling fresh and smelling great. Milled four times for premium quality, Deodorant Body Bar is blended with extracts from Palm and Coconut to generate a rich lather that washes off easily. 4 oz. ORDER NOW! BAR SOAPS: Natural Beauty Bar Soap, 4 oz. • Treatment Bar Soap Activated Charcoal: Power-packed, Treatment Bar Soap Activated Charcoal is for use on face and body to help dig down impurities and excess oil from skin! Made with Willow Bark Extract and Raw Honey to intensely cleanse and nurture acne prone skin. Helps calm and soften problem skin. Fragranced with cold-pressed Sweet Orange essential oil. 5 oz.. ORDER NOW! Ingredients: Cocos Nucifera (Coconut) Oil, Elaeis Guineensis (Palm) Oil, Carthamus Tinctorius (Safflower) Seed Oil, Glycerin (Of Vegetable Origin), Goat Milk (Liquid), Activated Charcoal, Sclerocarya Birrea (Marula) Seed Oil, Salix Nigra (Willow) Bark Extract, Raw Honey, Citrus Sinensis (Sweet Orange) Oil, Purified Water, Sodium Chloride (Salt), Sodium Hydroxide (Saponifying Agent), Sorbitol (Moisturizer), Sorbitan Oleate (Emulsifier), Oat Protein (Conditioner), Titanium Dioxide. • Milk Bar Soap Lemon Avocado: Ultra-moisturizing Lemon Avocado Milk Soap is made with rich Avocado Butter, calming Goat's Milk to hydrate and nurture dry skin. Fragranced with pure, cold-pressed Lemon essential oil, your skin helps soak in the luxury!. 5 oz. ORDER NOW! Ingredients: Cocos Nucifera (Coconut) Oil, Elaeis Guineensis (Palm) Oil, Carthamus Tinctorius (Safflower) Seed Oil, Glycerin (Of Vegetable Origin), Goat Milk (Liquid), Persea Gratissima (Avocado) Oil, Calendula Officinalis Flower Extract, Citrus Limonium (Lemon) Oil, Purified Water, Sodium Chloride (Salt), Sodium Hydroxide (Saponifying Agent), Sorbitol (Moisturizer), Sorbitan Oleate (Emulsifier), Oat Protein (Conditioner), Titanium Dioxide. • Gardener's Glee Soap Lavender Goat Milk: Ultra-moisturizing, Gardener's Glee Lavender Goat Milk Soap is made with Calendula Petals and Pomegranate Seed Oil to helps hydrate and nurture dry skin. Fragranced with pure steam-distilled Lavender essential oil. 5 oz. ORDER NOW! Ingredients: Cocos Nucifera (Coconut) Oil, Elaeis Guineensis (Palm) Oil, Carthamus Tinctorius (Safflower) Seed Oil, Glycerin (Of Vegetable Origin), Goat Milk (Liquid), Calendula Officinalis Flower Extract, Punica Granatum (Pomegranate) Seed Oil, Lavandula Angustifolia (Lavender) Oil, Calendula Petals, Purified Water, Sodium Chloride (Salt), Sodium Hydroxide (Saponifying Agent), Sorbitol (Moisturizer), Sorbitan Oleate (Emulsifier), Oat Protein (Conditioner), Titanium Dioxide. Natural, Pure Castile Bar Soap is made with Coconut and Olive Oils to provide gentle cleansing for your face, hands and. Free from dyes, sulfates and preservatives. • Pure Castile Soap Clary Sage: Revel in the naturally pure-and-gentle lather of Pure Castile Soap Clary Sage with a calm, floral fragrance. This heartfelt, herbal aroma elevates and unwinds. Find stability with this scent known for its power to provide clearness and focus. 8 oz. ORDER NOW! Ingredients: Sodium Palmate, Sodium Cocoate, Water/Aqua/Eau, Glycerin, Fragrance/Parfum, Sodium Chloride, Tetrasodium Glutamate Diacetate, Rosmarinus Officinalis (Rosemary) Leaf Extract, Olea Europaea (Olive) Fruit Oil, Simmondsia Chinensis (Jojoba) Seed Oil, Tocopherol Acetate (Vitamin E). • Pure Castile Soap Lavender: Take pleasure in the naturally pure-and-gentle lather Lavender Castile Soap with a soothing, floral fragrance. Lavender helps calm and rejuvenate to relax. 8 oz. ORDER NOW! • Pure Castile Soap Peppermint: Delight in the naturally pure-and-gentle lather of Peppermint Castile Soap with a tingling, fortifying aroma. The eye-opening, minty fragrance of Peppermint fills a fragrant touch. 8 oz. ORDER NOW! Ingredients: Sodium Palmate, Sodium Cocoate, Water/Aqua/Eau, Glycerin, Fragrance/Parfum, Sodium Chloride, Tetrasodium Glutamate Diacetate, Rosmarinus Officinalis (Rosemary) Leaf Extract, Olea Europaea (Olive) Fruit Oil, Simmondsia Chinensis (Jojoba) Seed Oil, Tocopherol Acetate (Vitamin E)..
BAR SOAPS: Pure Castile Soap, 8 oz. Combined with Palm Oil, saponified Coconut Oil, Vegetable Glycerin, Organic Shea Butter, Natural Colorants, Blends of Natural and Essential Oils and Fragrance. • Bar Soap Almond Gourmande: Infused with the fragrance of Almond-encrusted croissant served with your Cafe Au Lait. 6 oz. ORDER NOW! • Bar Soap Blooming Jasmine: Infused with the scent of sweet Jasmine growing wild along a winding country lane. 6 oz. ORDER NOW! • Bar Soap Climbing Wild Rose: Infused with the scent of fresh wild Roses embracing the stone walls of a Provencal cottage. 6 oz. ORDER NOW! • Bar Soap Green Tea: Infused with the fragrance of fresh Green Tea steeping alongside a Provencal spa bath. 6 oz. ORDER NOW! • Bar Soap Herbes de Provence: Blended with the fragrance of a freshly-dried herbal bouquet exciting the air of a village market. 6 oz. ORDER NOW! BAR SOAPS: Bar Soap, 6 oz. • Bar Soap Lavender Fields: Combined with the aroma of fresh Lavender warmed by the Mediterranean sun. 6 oz. ORDER NOW! • Bar Soap Lemon Verbena: Blended with the fragrance of fresh Lemon trees growing among a cluster of Verbena plants. 6 oz. ORDER NOW! • Bar Soap Lush Gardenia: Infused with the aroma of lush Gardenia cherished in a centuries-old greenhouse. 6 oz. ORDER NOW! • Bar Soap Mediterranean Fig: Blended with the luxuriant aroma of fresh-cut Figs ripened in the salty Mediterranean air. 6 oz. ORDER NOW! Natural Soap is blended with the essential oils and clay, providing moisture and minerals to the skin to revitalize and purify the skin without drying. Made with Calcium Montmorillonite clay, a soft mineral clay, to help cleanse and nurture the skin. Kanwa, this clay possesses a powerful ionic charge that helps absorbs toxins from the body, gently detoxifies, and ensure skin health. • Ancient Clay Organic Soap Big River: Helps hydrate, condition, and soften skin without drying, long lasting and luxurious. Narcissus Bulb Extract is used in skin creams to improve firmness and skin cell durability. Narcissus signifies rebirth and new beginnings. 10.5 oz. ORDER NOW! Ingredients: Calcium Montmorillonite Clay (Kanwa), Shea Butter, Edible Coconut and Olive Oil, Narcissus Bulb Extract Essential Oil Fragrance. • Ancient Clay Organic Soap Golden Sun: Mildly astringent without drying your skin, this summery citrus soap helps to energize your day. Made with Lemon Verbena that contains an essential oil fragrance to help increase energy and alleviate fatigue. 10.5 oz. ORDER NOW! Ingredients: Calcium Montmorillonite Clay (Kanwa), Shea Butter, Edible Coconut and Olive Oil, Grapefruit & Lemon Verbena Essential Oil Fragrance. • Ancient Clay Organic Soap River Spring: Help the skin retain an ideal moisture balance. Scented with a fresh burst of stimulating Green Tea to wake up refreshed and uplifted. Energizing fragrance of Mandarin and Green Tea will enliven your senses. Big bar last a long time. 10.5 oz. ORDER NOW! Ingredients: Montmorillonite Clay (Kanwa), Coconut Oil (Edible), Palm Oil (Edible), Essential Oils, Fragrance (Mandarin, Green Tea). BAR SOAPS: Ancient Clay Organic Soap, 10.5 oz. • Ancient Clay Organic Soap Dream Cloud: Made with a high quality nutrient rich clay, pure Coconut and Olive oil to help naturally cleanse your skin. Dream Cloud has a refreshing citrus scent like an orchard in bloom. The revitalizing fragrance comes from the blend of essential oils and Tangerine Oil. The scent of Tangerine essential oil is enriched with natural antioxidants which fortifies and tone tissues, balance and detoxifying skin. 6 oz. ORDER NOW! Ingredients: Calcium Montmorillonite Clay (Kanwa), Shea Butter, Coconut and Olive Oil, Tangerine Peel Essential Oil Fragrance. • Ancient Clay Organic Soap Blue Sky: Revitalizing Blue Sky Soap provides moisture to tired skin with gentle exfoliant action and natural fruit enzymes. Fresh sweet, lasting, Pineapple fragrance helps awaken your senses with a refreshing splash of tropical paradise! Made with Pineapple is an outstanding source of Antioxidant Vitamin and Vitamin C provides natural therapy for boosting immunity. 6 oz. ORDER NOW! Ingredients: Calcium Montmorillonite Clay (Kanwa), Shea Butter, Edible Coconut and Olive Oil, Pineapple/Coconut Essential Oil Fragrance. • Ancient Clay Organic Soap Mountain Rain: Revives skin leaving it soft and supple to the touch. The fragrance of Lavender essential oil helps calm the senses and lifts the spirits. 6 oz. ORDER NOW! Ingredients: Calcium Montmorillonite Clay (Kanwa), Shea Butter. Edible Coconut and Olive Oil, Lavender Essential Oil Fragrance. • Ancient Clay Organic Soap Song Bird: Helps cleanse gently and effectively, leaving skin moisturized and fragrantly fresh. The essential oil scent of White Lotus Blossom to help arouse a state of peaceful satisfaction. The aroma of Lotus Blossom symbolizes absolute beauty. 6 oz. ORDER NOW! Ingredients: Calcium Montmorillonite Clay (Kanwa), Shea Butter, Edible Coconut and Olive Oil, Lotus Flower Essential Oil Fragrance. • Ancient Clay Organic Soap Sunrise: Helps to heal dry, chapped and cracked skin, and stabilizes the moisture in skin. Suitable for all skin types, especially for dry or mature aging skin. Made with Cucumber Seed Oil that contains a concentrated amount of Vitamin C and Proteolytic Enzymes, to help rejuvenate skin with its exfoliating abilities. 6 oz. ORDER NOW! Ingredients: Calcium Montmorillonite Clay (Kanwa), Shea Butter, Edible Coconut and Olive Oil, Cucumber Seed Essential Oil Fragrance. • Ancient Clay Organic Soap Wind: Washes away dirt and grime as it calms and rejuvenates. Tea Tree oil is a natural antiseptic and germicide with healing properties and helps refresh the senses and treat skin infections. 6 oz. ORDER NOW! Ingredients: Calcium Montmorillonite Clay (Kanwa), Shea Butter, Edible Coconut and Olive Oil, Tea Tree Essential Oil Fragrance. • Ancient Clay Organic Soap Moon Dance: Fragrance Free. Blended with a high grade nutrient rich clay, Shea Butter and herbal extracts. 6 oz. ORDER NOW! BAR SOAPS: Ancient Clay Organic Soap, 6 oz. Goat's Milk Soap: Goat's milk has long been known as a rejuvenator and a moisturizer of human skin. Goat's milk is the milk that contains the most capric-capryllic triglycerides, which helps moisturize the skin contributing to its softness. Our goat's milk soap is extra gentle bringing this ancient legacy to life. •Goat's Milk Soap Original: Combined with an all natural soap base with fresh goat's milk and our original fragrance of essential oils which will leave your skin feeling soft and rejuvenated. The fragrance that we use is very mild and is described by many people as "fresh" or "clean" smelling. 5 oz. ORDER NOW! Ingredients: Sodium Tallowate, Sodium Cocate, Water, Fresh Goat's Milk, FDA approved Fragrance Glycerin, Titanium Dioxide, Sodium Chloride, Tetrasodium EDTA, DMDM Hydantoin. • Goat's Milk Soap Fragrance Free: Fragrance free, beneficial for those with extra sensitive skin. 5 oz. ORDER NOW! Ingredients: Sodium Tallowate, Sodium Cocoate, Water/Aqua, Fresh Goat's Milk/ Caprae Lac, Glycerin, Titanium Dioxide, Sodium Chloride, Tetrasodium EDTA, DMDMHydantoin. • Goat's Milk Soap Lavender: Made with fresh goat's milk by adding Lavender Oil, known for its antibacterial and soothing properties. Lavender is also helpful in treating acne, psoriasis, eczema and other skin inflammations. 5 oz. ORDER TODAY! • Goat's Milk Soap Olive Oil & Wheat Proteins: Made with fresh Goat's Milk, Olive Oil and Wheat Protein, both known for their antioxidants and moisturizing properties. Olive oil nurtures the skin and Wheat Protein renews its natural elasticity. Leaves skin toned, moisturized and soft to the touch. You will love the delicate, natural fragrance. 5 oz. ORDER TODAY! Ingredients: Sodium Palmate, Sodium Palm Kernelate, Aqua/Water/Eau, Caprae Lac/Goat Milk/Lait De Chèvre/Leche De Capra, Glycerin, Parfum/Fragrance, Palm Kernel Acid, Olea Europaea (Olive) Fruit Oil, Wheat Amino Acids, Sodium Chloride, Potassium Sorbate, Tetrasodium EDTA, Tetrasodium Etidronate, Titanium Dioxide, Benzyl Salicylate, Butylphenyl Methylpropional, Hexyl Cinnamal, Linalool. Goat's Milk Soap: Original, 5 oz. Goat's Milk Soap: Fragrance Free, 5 oz. Goat's Milk Soap: Lavender, 5 oz. Goat's Milk Soap Olive Oil & Wheat Proteins, 5 oz. BAR SOAPS: Goat's Milk Soap, 5 oz. • Bar Soap Peppermint: This rich foaming bar soap cleanses and calms the skin and leaves the senses invigorated with refreshing scent of Peppermint Oil. Made with Palm oil and Australian Tea Tree Oil to thoroughly cleanse the skin and Aloe Vera and Jojoba Oil to add moisture. 5 oz. ORDER NOW! Ingredients: Saponified Palm Oil and Palm Kernel Oil, Water, Glycerin, Peppermint Oil, Australian Eco-Harvest Tea Tree Oil, Jojoba Seed Oil, Aloe Vera Leaf Juice, Salt, Citric Acid . • Bar Soap Lemongrass: This creamy, naturally scented bar gently cleanses skin, leaving it smooth and silky to the touch. Made with Palm Oil to refresh skin with the astringent properties of Lemongrass Oil to uplift the senses. Aloe Vera and Jojoba Oil hydrate and soften. 5 oz. ORDER NOW! Ingredients: Sodium Palmate, Sodium Cocoate/Sodium Palm Kernelate, Water, Vegetable Glycerin, Natural Aroma Blend, Olea Europaea (Olive) Fruit Oil, Certified Organic Rubus Idaeus (Raspberry) Extract, Aloe Barbadensis Leaf Juice, Butyrospermum Parkii (Shea Butter), Sodium Chloride, Sodium Gluconate. • Bar Soap Creamy Coconut: This rich-foaming, moisturizing bar naturally exfoliates skin with Jojoba meal, gently removing dirt and dead skin cells. Colloidal Oatmeal helps calm and protect dry and itchy skin. Made with sustainably harvested Palm oil and infused with a delightful natural Coconut fragrance to transport you to your own paradise in the shower. 5 oz. ORDER NOW! Ingredients: Sodium Palmate, Sodium Cocoate/Sodium Palm Kernelate, Water, Vegetable Glycerin, Natural Aroma Blend, Lavandula Augustifolia (Lavender), Olea Europaea (Olive) Fruit Oil, Aloe Barbadensis Leaf Juice, Butyrospermum Parki (Shea Butter), Sodium Chloride, Sodium Gluconate. • Bar Soap Tea Tree Therapy: Tea Tree Therapy Bar Soap is made with moisturizing Jojoba Oil, calming Aloe Vera and the antiseptic properties of our Eco-Harvest Tea Tree Oil to clean and enrich all skin types. The invigorating, natural, vegetable-based formula can be used on your face and body. Works great as a prep for shaving and helps soften skin with a silky, smooth finish. 5 oz. ORDER NOW! Ingredients: Saponified Palm Oil, Saponified Palm Kernel Oil, Water, Glycerin, Eco-Harvest(R) Tea Tree Leaf Oil, Jojoba Seed Oil, Aloe Barbadensis Leaf Juice, Sodium Chloride. BAR SOAP: Bar Soap, 5 oz. Organic Cold Pressed Coconut Oil Soap for Face and Body: Made with 100% Certified Organic Coconut Oil, naturally enriched with high amounts of vitamins A, B, C and E. Coconut Oil helps calm irritated skin, restore and protect skin from free radicals. Coconut oil Soap helps fight and slow down the aging process of your skin. Used as a body soap, facial cleanser, and even a shampoo for those with short hair. Simply lather the organic soap while in the shower and use it to clean your body, face, and hair. • Coconut Oil Soap Pineapple Coconut: Invigorate your island spirit with this tropical blend of Pineapple Coconut. 7 oz. ORDER TODAY! Ingredients: Traditional Saponified Cold Pressed Virgin Coconut Oil, Pineapple Coconut Blend. • Coconut Oil Soap Cucumber Melon: Let the renewed touch of Cucumber Melon soap rejuvenate and calm your skin. 7 oz. ORDER TODAY! Ingredients: Traditional Saponified Cold Pressed Virgin Coconut Oil, Cucumber Melon Blend. • Coconut Oil Soap Fragrance Free: Fragrance Free is ideal for fragrant sensitive skin and for those who desire to delight in the natural pureness of Coconut oil. 7 oz. ORDER TODAY! Ingredients: Traditional Saponified Cold Pressed Virgin Coconut Oil. • Coconut Oil Soap Awapuhi Seaberry: Blend of Awapuhi Seaberry transport you away upon an exotic tropical breeze. 7 oz. ORDER TODAY! Ingredients: Traditional Saponified Cold Pressed Virgin Coconut Oil, Awapuhi Seaberry Blend. BAR SOAPS: Coconut Oil Soap, 7 oz.